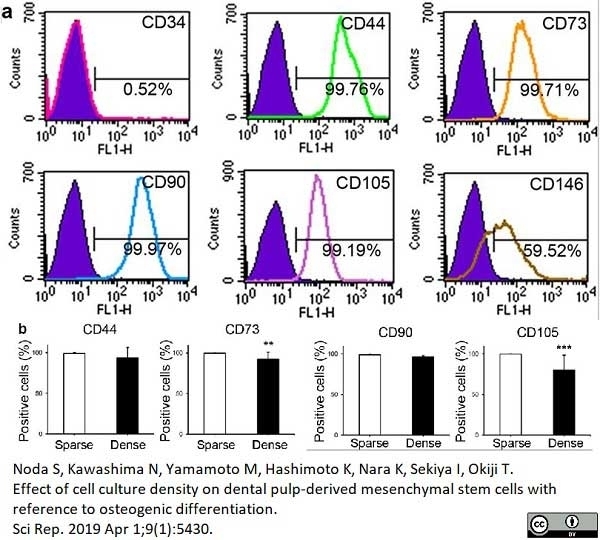 Mouse anti Human CD90 antibody, clone F15-42-1 (MCA90) used for the evaluation of CD90 expression on dental pulp derived cells by flow cytometry. Mouse anti Human CD90 antibody, clone F15-42-1 recognizes the human CD90 cell surface antigen, a ~25 kDa glycoprotein homologous to rat Thy1. The antigen is expressed by a subset of CD34+ve cells in the bone marrow and by prothymocytes within the thymus. CD90 is also expressed extensively within the brain. 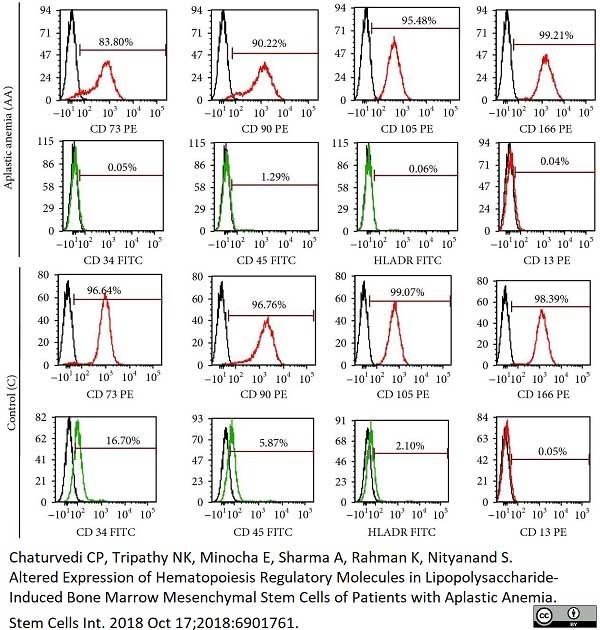 Mouse anti Human CD90 antibody, clone F15-42-1 is routinely tested in flow cytometry on the MOLT4 cell line. Reconstitute in 1 ml distilled water. Care should be taken during reconstitution as the protein may appear as a film at the bottom of the vial. Bio-Rad recommend that the vial is gently vortexed after reconstitution and microcentrifuged before use. Prior to reconstitution store at +4°C. After reconstitution store at +4°C. DO NOT FREEZE. This product should be stored undiluted. McKenzie, J.L. & Fabre, J.W. (1981) Human thy-1: unusual localization and possible functional significance in lymphoid tissues. J Immunol. 126 (3): 843-50. Daar, A.S. & Fabre, J.W. (1981) Demonstration with monoclonal antibodies of an unusual mononuclear cell infiltrate and loss of normal epithelial membrane antigens in human breast carcinomas. Fiegel, H.C. et al. (2004) Stem-like cells in human hepatoblastoma. J Histochem Cytochem. 52 (11): 1495-501. Hagood, J.S. et al. (2005) Loss of fibroblast Thy-1 expression correlates with lung fibrogenesis. Am J Pathol. 167 (2): 365-79. Diaz-Romero, J. et al. (2008) Immunophenotypic changes of human articular chondrocytes during monolayer culture reflect bona fide dedifferentiation rather than amplification of progenitor cells. J Cell Physiol. 214: 75-83. Cox, G. et al. (2011) The use of the reamer-irrigator-aspirator to harvest mesenchymal stem cells. J Bone Joint Surg Br. 93: 517-24. Cizeau, J. et al. (2011) Fusogenics: a recombinant immunotoxin-based screening platform to select internalizing tumor-specific antibody fragments. J Biomol Screen. 16: 90-100. Gieseke, F. et al. (2010) Human multipotent mesenchymal stromal cells use galectin-1 to inhibit immune effector cells. Hauser, P.V. et al. (2010) Stem cells derived from human amniotic fluid contribute to acute kidney injury recovery. Am J Pathol. 177: 2011-21. Holzwarth, C. et al. (2010) Low physiologic oxygen tensions reduce proliferation and differentiation of human multipotent mesenchymal stromal cells. Karlsen, T.A. et al. (2010) Human primary articular chondrocytes, chondroblasts-like cells, and dedifferentiated chondrocytes: differences in gene, microRNA, and protein expression and phenotype. Tissue Eng Part C Methods. 17: 219-27. Manochantr, S. et al. (2010) Isolation, characterization and neural differentiation potential of amnion derived mesenchymal stem cells. J Med Assoc Thai. 93 Suppl 7: S183-91. Meng, J. et al (2011) Contribution of human muscle-derived cells to skeletal muscle regeneration in dystrophic host mice. Pessina, A. et al. (2010) CD45+/CD133+ positive cells expanded from umbilical cord blood expressing PDX-1 and markers of pluripotency. Cell Biol Int. 34: 783-90. Tome, M. et al. (2007) Calponin is expressed by subpopulations of connective tissue cells but not olfactory ensheathing cells in the neonatal olfactory mucosa. Yin, S. et al. (2010) Chondrogenic transdifferentiation of human dermal fibroblasts stimulated with cartilage-derived morphogenetic protein 1. Tissue Eng Part A. 16: 1633-43. Shafaei, H. et al. (2011) Effects of human placental serum on proliferation and morphology of human adipose tissue-derived stem cells. Bone Marrow Transplant. 46: 1464-71. Escobar, C.H. & Chaparro, O. (2016) Xeno-Free Extraction, Culture, and Cryopreservation of Human Adipose-Derived Mesenchymal Stem Cells. Stem Cells Transl Med. 5 (3): 358-65. Shinoda, K. et al. (2016) Thy1+IL-7+ lymphatic endothelial cells in iBALT provide a survival niche for memory T-helper cells in allergic airway inflammation. Kamprom, W. et al. (2016) Endothelial Progenitor Cell Migration-Enhancing Factors in the Secretome of Placental-Derived Mesenchymal Stem Cells. Stem Cells Int. 2016: 2514326. Vaquero, J. et al. (2016) An approach to personalized cell therapy in chronic complete paraplegia: The Puerta de Hierro phase I/II clinical trial. Zhang, X. et al. (2017) Regeneration of hyaline-like cartilage in situ with SOX9 stimulation of bone marrow-derived mesenchymal stem cells. PLoS One. 12 (6): e0180138. GarikipatiV, N.S. et al. (2018) Isolation and characterization of mesenchymal stem cells from human fetus heart. PLoS One. 13 (2): e0192244.